Homes and businesses were left in devastation by Hurricane Michael in October 2018 in Mexico Beach, Florida. Storms like this are waking more people up to a changing climate. New polls show recent disasters and personal experience have raised and widened global warming worries, but researchers warn of a huge gap between awareness and an adequate response. Two independent surveys of American attitudes on human-driven global warming, one focused on perceptions of risk, the other on possible responses, suggest a shift long sought by climate campaigners and scientists who’ve been pointing out rising danger for decades. 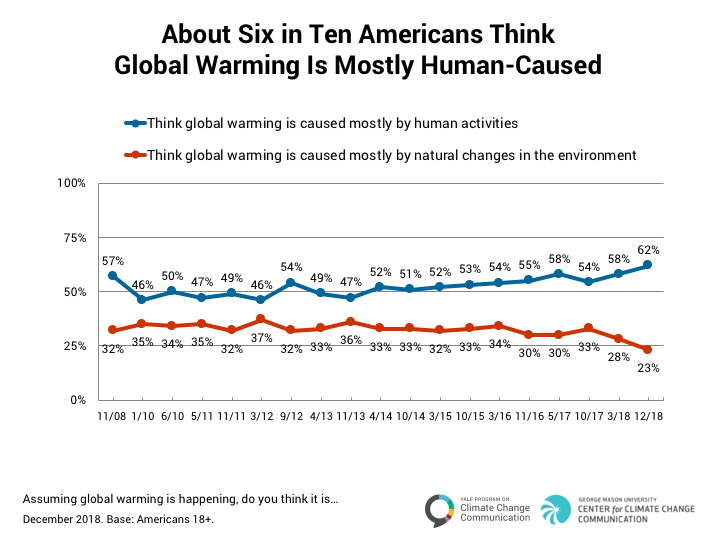 With a substantial surge in recent months, most Americans (outside of a small, but influential fringe, 7 percent, who dismiss the issue outright) have gotten well past the “is it happening” question on human-driven climate change. Nearly half in one survey said they would support a tax based on the amount of carbon in fuels that, when burned, generate the main climate-warming greenhouse gas emission, carbon dioxide. The shift seems driven less by politician’s positions than recent disastrous heat-fueled wildfires, catastrophic hurricane strikes, and widening experience with changing climate conditions across the country. Both surveys were conducted late last year, when California’s latest burst of conflagrations was still in headlines and not long after a major new report from the United Nations climate panel offered a fresh round of warnings on the cost of delay in cutting heating emissions. The survey, conducted around the first week of December, also showed a surge in the number of Americans who feel a more direct sense of engagement on the issue. “The percentage of Americans who say global warming is personally important is now at a record high, 72 percent, up 9 percentage points since March 2018,” said Anthony Leiserowitz, the director of Yale’s program on climate change communication. This study sought feelings as much as perceptions of fact, noting: “Majorities also feel ‘disgusted’ (53 percent) and/or ‘helpless’ (51 percent). Nearly half are ‘hopeful’ (48 percent). The second survey, titled “Is the Public Willing to Pay to Help Fix Climate Change?”, echoed the Yale-George Mason findings on widening acceptance of science revealing human-driven climate change. Among those who said they have become more convinced in the last five years, 76 percent described extreme weather events as the most influential factor shifting their views. The poll of 1,200 people was conducted in mid-November by the Energy Policy Institute at the University of Chicago and the Chicago-based Associated Press-NORC Center for Public Affairs Research. This survey centered more on solutions, providing new detail on Americans’ preferences for how to address the problem. For example, the poll found that 44 percent of Americans would support a carbon tax. But the chief architect of the survey, Michael Greenstone of the University of Chicago, said there were some important surprises when a hypothetical menu of options for a carbon tax were laid out as a secondary question. Support for a carbon tax rose to a remarkable 67 percent if the proceeds were used to restore forests, wetlands, and other environmental assets. Echoing earlier surveys by the Yale-George Mason group, nearly 60 percent would support a tax if the funds paid for research and development on renewable energy. But when offered as a choice, the carbon tax option that has gained the most steam in Washington, in which revenue is fully returned to households, had barely a bump from the response to the general idea—from 44 percent to 49. Variations on this kind of tax or fee and rebate have been proposed for more than a decade by people as varied as the retired NASA climate scientist James Hansen and President Reagan’s secretary of state, George P. Shultz, and secretary of the treasury, James A. Baker III. In an interview, Greenstone said the longstanding logic in such proposals is simple. A tax and rebate system would guarantee to critics of big government that the money wouldn’t be diverted and would offset higher energy costs for low-income families. Time will tell. Politics, at the moment, is in widespread paralysis far beyond discussions of climate policy. Some scholars focused on environmental policy see such poll results, while encouraging, as assuming too much political power in public opinion on such issues. Robert Brulle, a visiting professor of environment and society at Brown University, has studied the social dynamics of environmental policy fights for decades. In an interview, he said far too much hope is pinned by environmental groups and funders on shaping public opinion as a way to drive change in Washington. Fundamental structural issues around Congress, particularly, have blocked change even when the country is powerfully aligned, he said, citing the failure on even modest progress on gun control as one example. The situation is even worse with a grand challenge like global warming, where stabilizing the carbon dioxide concentration in the atmosphere would require emissions of the gas around the world to drop to zero in this century, even as the human population passes 9 billion people, all seeking decent lives. In a new paper on “climate change and social inertia” Brulle and Kari Norgaard of the University of Oregon noted that the difference between climate concerns in Europe and the United States is not as different as some have proposed. And Europe, while often hailed for green sensibilities, is nowhere near the track it pledged for emissions under the Paris Agreement on climate change, Brulle said. Something deeper is afoot. The paper proposes that an emerging threat can only be addressed by reassessing longstanding social, personal, economic or political norms. Shifting behaviors can be difficult and go beyond individual choice to rethinking whole systems. Another result? “People will just engage quite readily in two-track behavior”—pushing for aggressive legislation and flying to Washington to do so. Edward Maibach, the George Mason University researcher who co-directs the climate survey with Yale’s Leiserwowitz, is more hopeful. Andrew Revkin is the Strategic Adviser for Environmental and Science Journalism at the National Geographic Society and has written on global warming for 30 years. He is the author of three books about climate, most recently Weather: An Illustrated History, from Cloud Atlases to Climate Change. He covered the environment for years at the New York Times.